Today I experienced something I have never experienced before. It is one of those things that make you realize how lucky you have been in your life until that very moment. Before I tell you what happened I need to give you some background. I do not consider myself ultra-conservative when it comes to the mass, however I'm not one for liturgical dancing either. Liturgically, I consider myself middle of the road with a few lane changes to the left or to the right depending on the circumstances of the moment. The extent of my experience with liturgical abuses is what I have seen posted in Youtube and to this my reaction has always been to laugh it out and move on. Until today. As it happens I'm visiting my dad for a week to spend some quality time with him and allow my sister (his primary care giver) some quality time with her family. Usually when I come to visit I attend mass at my original parish church. Since the mass times were not convenient, today I decided to attend mass at another parish with a more convenient time (I'm trying to stay general when it comes to details to protect the privacy of everyone involved, priest and congregation). I showed up a bit early to have some time to wander around the almost 300 years old church I was visiting and enjoy some personal prayer time. In my wanderings I found myself standing in front of a very realistic crucifix. I was taken a back at the realism of this piece of art and started to reflect on the pain our Lord suffered for the sake of my own sins. As I went deeper in my reflection I realized I was experiencing a deep feeling of spiritual anguish. I was surprised by this and spent the rest of my time kneeling in front of the Blessed Sacrament wondering what the deal was with these feelings from just a few seconds ago. Mass was about to start so I walked to the very front pew and sat. How little did I know that soon all my questions about the source of spiritual anguish were going to be answered! I have never experienced a mass such as this. To say that the priest committed a few liturgical abuses is to put it nicely. Let me just mention the ones which come to my mind right at the moment. The priest’s greeting for the mass was "The grace of our Lord Jesus who died for our sins be with you". My first thought when I heard this was "What about God the Father, and the Holy Spirit??? I hope this is a Trinitarian Mass". The penitential rite was the priest leading us in a "Yoga breathing exercise" while repeating a mantra. There was no "May almighty God have Mercy on us". In fact there was no Kyrie. I was left wondering: "are my sins forgiven? Is the Blessed Mother, angels and saints praying for me?? Paul was a misogynist and a Manichean. Most demoniacs Jesus healed were just misunderstood epileptics. We should listen to what the UN tells us about the environment. A homily is a good place to quote Nietzsche. Once the homily was over (thankfully!!) we were led into the creed by the priest asking us "Do you believe in..." and us answering with the mantra we had just learned during the penitential rite. This ancient rite culminated by us assenting our belief in the "the Church which is One, Holy, Catholic, SINFUL and apostolic". During the "agnus dei" the priest gave a host to each extraordinary minister of communion, which they held in front of them and consumed at the same time the priest did (As if they were priests too!) after the recitation of "Lord I'm not worthy to receive you..."
Needless to say by then my jaw was hitting the ground! I kept asking myself “what am I supposed to do? Should I just walk away?" (Remember I was sitting in the first pew! ), but if I walk away, wouldn't I be abrogating my responsibility as clergy? I have always advised people that when they witness one the things I just described, the only course of action is to confront the priest after mass and let them know that we were not happy with the fact that he gave us their own personal version of the mass and not the mass of Jesus Christ. On the other hand, I was just visiting, and "incognito", nobody knew I'm a permanent deacon; why should I get involved in parish politics so far away from my own archdiocese?...I'm ashamed to say these were the arguments I used to convince myself that I should just sit down and endure the rest of mass until I could quietly walk away during the offertory collection...until and old gentlemen tapped me on the shoulder and said quietly "Could you help collecting the offering?" "GREAT!" I though "Now I'm STUCK!" I took the basket and walked with him down the middle isle of the church helping collect the community's offering. When we finished with the collection we moved to the consecration of the bread and wine. Up to that moment I was convinced I was witnessing an illicit mass; but when the priest changed the words of institution during the consecration of the wine I let out an audible groan from my lips. This mass was not only illicit but now it was dangerously close to be invalid! What was I supposed to do now?! I couldn't in good conscience walk away from this mess (I mean mass) without confronting this priest. Once gain I heard a little voice in my mind reminding me that this was not my parish, or diocese so, why make a fuss? ?...and once again I figure I should receive communion, but just the Body of Christ. Here I gave father the benefit of the doubt and assumed father had the right intention when he "kind of" followed the rubrics for the consecration of the bread. However I could not in good conscience partake of the wine since he had completely botched the words of institution for that one! Mercifully, by counting the vessels on the altar I realized that this was a "communion with one form" parish. So I told myself "after communion, I will quietly sneak out"... As I was on my way out, for a second time, I was stopped by the same gentlemen who once again asked me if I could help with the second collection!! By then, I had gotten the message. The reason why I decided to attend this mass on the first place, the reason why I had experienced the spiritual anguish before mass, the reason why I had been stopped (twice!) from leaving, was because I had to fraternally admonish this priest. After mass I waited until most people were gone and approached father trying to figure how to do this in the most non-confrontational way possible. I figure that I could live with most of the abuses but changing the words of institution was something I could not in good conscience ignore since this act was spiritually dangerous for this priest and his congregation. I put my hand on his shoulder and said quietly "Father, I'm a permanent deacon visiting for the day, please do not take this the wrong way, I'm saying this in the most fraternal way I can, please do not change the words of institution again!!" He looked at me confused and just mumbled "Its the translation, I just read what is in it, this is how we do it in this diocese" turned around and quickly walked away. My heart ached. I tell you reader, I don't know what was more painful, enduring this mass, or watching this priest walk away from me. After this (very painful) experience I kept asking myself if I fulfilled my obligation (of course there is the question of: Was this a mass? Did I fulfill my SUNDAY obligation? But those should be part of a different blog post). The bottom line is: I don't know. I know one thing. I learned a lot with this event. I learned a lot about how the Lord uses me, about the anguish he feels when His mass is profaned, about how much damage we can cause to the Body of Christ when we make the mass "our mass". Still I live with the nagging question, should I have said more? What is the moral of this story? Please pray for all our priests but especially for this very confused soul, so that light illuminates his mind and he realizes in what peril is he placing his flock and himself. 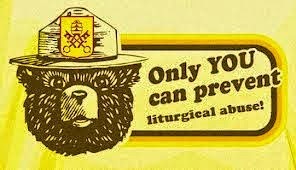 Obviously, liturgical abuse is tragic and unacceptable. But if you're left questioning whether the Blessed Mother and the saints are praying for you because the priest celebrated the mass incorrectly, you have a lot to learn about the Blessed Mother and the saints. If you think that you were in danger of not fulfilling your Sunday mass obligation or receiving Jesus' Body, Blood, Soul, and Divinity because the priest used the incorrect words, you have a lot to learn about Jesus. And if you think the two interruptions to ask you to help with the collection were more about you saving the day and admonishing a "very confused soul," and less about God desperately trying to communicate to you that the sacraments depend solely on His generous gifting of them to us, and not so much on the priest getting the words correct, you have a lot to learn about the Holy Spirit. You are right, I do have much to learn yet. Please receive my Diaconal Blessing for you and your family as well as rest assured of my prayers. I'd like to try that church... a celebration of the Spirit and Trinity. St. Mikes is oppressed by dogma such as you describe yourself as deeply anguished about. Do you question the heart and intention of this priest? God is about love and mass about feeding the spiritual call personally within our hearts so we can in turn serve others. Your judgements kept you from really receiving the greatest gifts of the mass.... St. Mike's sometimes reaches this spiritual nourishment -giving when you can literally feel the unity of love and spirit at communion...yet it is almost immediately squashed as someone speaks, usually long and sometimes insultingly about money or parish issues which are also in the bulletin. Count our family elsewhere during the next couple weeks of having the clergy actually take many minutes out of the mass to step-by-step tell us "on the line where it says 'name',write your name" etc. Tell me Dcn., which mass do you think would be more pleasing to our Father? And thank u in advance for your prayers...be assured of mine. I hope you return and read my answer to your comment..
>>>I'd like to try that church... a celebration of the Spirit and Trinity. St. Mikes is oppressed by dogma such as you describe yourself as deeply anguished about. I do not feel St Michael’s is particularly dogmatic, in fact I’m happy of our efforts to stay faithful to the magisterium and the sacred tradition of the Church. I have never heard anyone at St Michael preach fire and brimstone, or condemn anyone to hell, but I do not attend all the masses, although if this were to happen I’m sure I would have heard about it. >>>Do you question the heart and intention of this priest? I always question the intentions of every priest I have ever heard mass from. You see intention is very important when we talk about the mass. A priest which lacks of the same intention of the Church is in fact confecting a false sacrament when he celebrates mass, a priest can make a mistake here and there, but if it shows a pattern of disregarding the clear instruction the Church provides in the Roman Missal then he is just celebrating his own mass and not the mass of Jesus Christ taught to his apostles. >>> God is about love and mass about feeding the spiritual call personally within our hearts so we can in turn serve others. In part, it is also about making present the sacrifice of Jesus on the cross. You cannot have one and eliminate the other, then it is not a mass. If my blog post gave you that impression, perhaps I was not as clear as I could have been. It was very humbling to me to know that the Lord was placing me there to fraternally call this priest to evaluate what he was doing and how it affected his congregation. >>>St. Mike's sometimes reaches this spiritual nourishment -giving when you can literally feel the unity of love and spirit at communion...yet it is almost immediately squashed as someone speaks, usually long and sometimes insultingly about money or parish issues which are also in the bulletin. Count our family elsewhere during the next couple weeks of having the clergy actually take many minutes out of the mass to step-by-step tell us "on the line where it says 'name',write your name" etc. I guess this was the weekend of the Archbishop Appeal… I’m in a different diocese so I was spared the pledge, I only ask you to consider this: Father Mike is mandated by the bishop to do this pledge in that way…Do you think for a minute that he enjoys it? >>>Tell me Dcn., which mass do you think would be more pleasing to our Father? Malachi 1:11-12 “For from the rising of the sun to its setting my name will be great among the nations, and in every place incense will be offered to my name, and a pure offering. For my name will be great among the nations, says the LORD of hosts.” Anything else is less than an acceptable offering. Please be assured of my Diaconal Blessing and prayers. This may be something worth writing a letter to the bishop of that diocese about. The bishop is supposed to guarantee the orthodox nature of the divine liturgy and the sacraments for his flock, and it is possible he isn't aware of the problems here. Of course, use your own discretion, but these are serious abuses that deform the Holy Sacrifice of the Mass. Please know I am praying for all the ordained, bishops priests and deacons daily. Also my holy hour on Thursday is offered for all the ordained. Not only the ordained that need guidance but all the faithful who need encouragement as well as they try to help us walk closer with Christ. It appears to be in your state, if not your diocese. Every Catholic deserves reverent worship of our Sovereign Lord Jesus Christ. They need theocentric worship, not anthropocentric worship such as you encountered there, and which your anonymous commenter seems to support. All the best. Say the black, do the red. In responding I am assuming that both anonymous are the same person. My apologies in addressing both comments under one person if indeed there are two of you. You said: “If you think that you were in danger of not fulfilling your Sunday mass obligation or receiving Jesus' Body, Blood, Soul, and Divinity because the priest used the incorrect words, you have a lot to learn about Jesus.” Now although it is true that with God all things are possible, it is also equally true that there is a normative way in which God bestows the sacraments on people. Note I said “sacraments” not grace, as all sacraments are grace filled (if the person receiving is properly disposed), but not all grace is sacramental [grace]. I do not know how well educated you are in theology so I will just remind you of some basic points. Sacraments require both matter and form. The matter is the actual material used as part of the outwards sign such as oil, water, bread, and wine. The form are the words. Both matter and form are needed for a valid sacrament. Hence, for example, a priest in a concentration camp could not celebrate Mass if he had unleavened bread but no wine. He could not consecrate the bread because he had only one type of matter for this particular sacrament. It may seem “unfair,” but Jesus rather warned us in words and deeds that lots of things in this life are that way. Similarly, if a priest does not use the proper form, ie. words, it is not a sacrament. Now, again, the person in the pew may get some grace by thinking he is receiving The Lord in the host, but Jesus's Real Presence is not there because the priest did not use the form to consecrate the matter. In short, at the most the person had a “spiritual” communion. You may be wondering why God would not just let the issue go and pitch his tent in the species of bread and wine. Well, to make a long complicated matter rather simple, it comes down obedience and humility. The Church, the Bride of Christ who in her mystical form is perfect (it is us people that are the problem) has rules that we all must follow according to our vocation. We are called to be obedient, to be humble, to be docile (teachable). The Church, nay Jesus Himself, tells priests the form for consecrating the bread and wine during Mass. For a priest to willfully not say the words he is supposed to say denotes a disobedience and pride which, needless to say, is the antithesis of Jesus Christ and His Sacrifice. You see the conflict here, right? Furthermore, just think about the Real Presence. The Eucharist is Jesus Christ: body, blood, soul and divinity. The Author of all, Being itself degrades Himself for love of us in such a base way, and is subject to all sorts of abuse in His vulnerable guise of bead. Why, why would God Almighty placate to a prideful creature ordering Him around in order to be further abused? Lastly, God is being merciful to both the priest and congregates in not transubstantiating the bread and wine. Stupid limit is requiring me to break this post - sorry for being so long winded. Now for the second post. I do not understand half of the St Mike and what not talk, so I will just stick to this one sentence: “God is about love and mass about feeding the spiritual call personally within our hearts so we can in turn serve others.” God is love. Sorry I felt compelled to make a distinction, but God Is. We owe him all, he is the creator of all and we are his creation. We may be all about love and mercy and justice and goodness, but God is love, mercy, justice and goodness. Returning to love though. Here are the hard facts. One of acts of charity (love) is “admonishing the sinner.” We are called to minister to people in words and deeds, and that includes mentioning sin and sinfulness to people (to them mind) by its proper name and in its proper content: as an offense to God and society. I doubt many people like to do it, but it is an act of love. Jesus being abused, tortured humiliated, and dying for us is love. Washing smelly excrement off the back of some helpless person is love. Not wanting stir the waters for a facade image (be it personal or general) or “peace” is not love. Entangling others in a life of sin is not an act of love. The Eucharist is the source and summit of Christian life. The greatest treasure the Church has is Christ Himself in the Eucharist. We are given the Eucharist through the Mass. There are many, many, many graces given to the world in general because of the Holy Sacrifice of the Mass as the Mass makes present Jesus's sacrifice (we are literally back in time during the consecration). It is so awesome, transcendent, and unearthly it is probably a great mercy we cannot see what is going on. Tis true one of the many graces and gifts of Mass is on a personal level which we then, through God's grace, bring to others. But that is by no means the purpose of the Mass. We go to Mas because we are obliged to go. God, our Father and Lord, tells us as his adopted Children to go, and we go. Whether we receive the Eucharist or not, we owe God Sunday Mass. The Mass is not about us and feeling better. Sure God bestows personal graces and one may feel happy, but these are not the reasons there is the Sacred Mysteries. I strongly urge you, Deacon, to write a letter to the bishop of this diocese. He may not be aware of what is going on, and there are many souls involved here. Report what happened during church. I think you should also include what the priest said to you. The Mass is not our play toy. It belongs to God. To mess with it - - - - well it is dangerous. God may have brought you there not just to talk to the priest, but so you write his bishop. The bishop can bring the Real Presence to the 300 year old Church again. God speed, Regina. Not a word about the purpose of worship, and the real meanings. So sad you're so hung up on the external details of ritual. You REALLY think the Creator of 600 sextillion stars REALLY cares about the details of a ritual ? Deacon Harbey, you absolutely did the right thing by chastising the priest. The rituals do matter. The words do matter. The intent does matter. Our Lady of Good Success warned in the 16th century that we would face great abuses in the Church during the 19th and 20th century,including sacrilege, abuse of the Host and corruption of vocations. Here we are in 2015 and the assault on faith is everywhere, in every facet of life. The lack of respect and reverence for the tradition of the Mass is appalling but not surprising. This is not about being old fashioned and stuffy or "hung up" on externals, this is about worship of God. Worship man or worship God, the choice is ours. A house divided against itself can not stand and that is the goal of the Enemy. We must be united in the celebration of the Mass. Deacon Harbey, you were absolutely corrent in confronting the priest. He does not have the authority, regardless of his feelings, to change how the Church prescribes the Mass to be celebrated. The Mass is public worship of the body of Christ, noone, not even a priest may change or modify any part of the Mass. This has been reiterated by Vatican II multiple times. You are not being judgmental, rather exercising your RIGHT as a baptized Catholic to have Mass celebrated properly. If this was the usual way Mass was celebrated at that parish, then a letter to the Bishop and the pastor of the parish is in order. Yes, expect some fall-out but we are called to be the eyes and hears of the bishop as well as standing up for Church teaching's.